The third annual D23 Expo is in full swing today in Anaheim, California! During the day’s big movie panel, “Worlds, Galaxies and Universes: Live Action at the Walt Disney Studios,” Pirates of the Caribbean: Dead Men Tell No Tales leading man Johnny Depp took to the stage in full costume as Captain Jack Sparrow. What’s more, it was revealed that another familiar face will be reprising his role for the latest chapter of the Pirates of the Caribbean franchise. 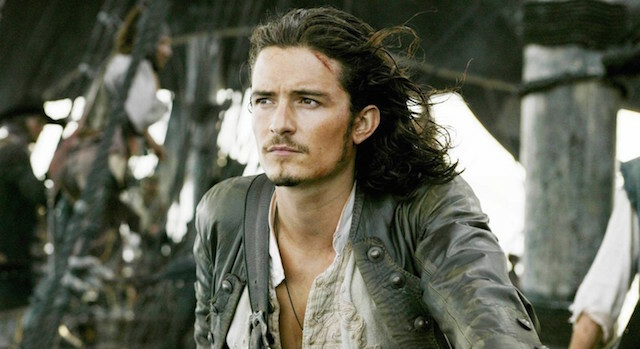 Orlando Bloom is set to return as Will Turner! Directed by Norwegian filmmakers Espen Sandberg and Joachim Rønning (Kon-Tiki), Pirates of the Caribbean: Dead Men Tell No Tales will, as previously announced, also feature the return of Geoffrey Rush as Captain Barbosa as he and Captain Jack face a new villian, Captain Salazar, played by Academy Award winner Javier Bardem. The Maze Runner star Kaya Scodelario also joins the ensemble, playing a new character named Carina Smyth while Brenton Thwaites (Maleficent, The Giver) plays another new character named Henry. Bloom played the Turner role in the first three films in the franchise: Curse of the Black Pearl (2003), Dead Man’s Chest (2006) and At World’s End (2007). At the conclusion of At World’s End, Turner was left to Captain the ethereal vessel, the Dutchman, ferrying souls to the afterlife. We last saw him in a post-credits sequence, returning to Keira Knightley’s Elizabeth Swann and their son after ten years at sea. Catch Pirates of the Caribbean: Dead Men Tell No Tales in theaters July 7, 2017 and check out ComingSoon.net’s full live blog of today’s D23 presentation right here. You can also check out a recap of the Marvel Studios footage and concept art shown right here.